The Serve-and-Volley game of Tennis, One-On-One Doubles, is bringing its professional tennis tournament, combined with a rockin' blues concert after party, to be held at the Country Club of Winter Haven on Saturday, April 28 from 2:00-6:30 p.m. The Winter Haven One-On-One Doubles Prize Money Shootout will feature Grand Slam Tennis Legends Emilio Sanchez, three time Grand Slam Doubles Champion, Luke Jensen, 1993 French Open Doubles Champion, Fritz Buehning, Grand Slam Doubles Finalist, at the U. S. Open, in 1983 and Mel Purcell, former top 20 in the World's ATP Singles player. The Legends will compete in a 2 hour round-robin format, first to win 5 games, no-ad scoring with a 9-point tiebreaker played at 4-4. .
“The format is action packed and fast paced serve-and-volley Tennis that one can only see at these One-On-One Doubles Tournaments”, states Andy Gladstone, Player Development Coordinator for USTA Florida. One-On-One Doubles Tournament Events are some of the most unique in the tennis industry, as live concerts are always part of the overall event. RJ Howson & Band, one of Chicago’s national touring acts, brings their original rock, blues and funk sound to Winter Haven to celebrate the One-On-One Doubles Shootout Event..
“Showcasing the Serve-and-Volley game, to the Tennis and sports fans, with some of the game’s most exciting Tennis Legends, is a dream come true. We are not seeing much, if any, serve-and-volley Tennis these days, so this game, One-On-One Doubles, brings this style of entertaining play to the tennis fans of Polk County and to television. ", states Ed Krass, Founder/Director of the One-On-One Doubles Prize Money Shootouts. Ed is a former Harvard Women’s Tennis Coach and he will direct his 30th Annual College Tennis Exposure Camps, this summer, throughout the US. One-On-One Doubles, known as the Third Game of Tennis, alongside Singles and Doubles, is sanctioned by USTA/ Florida for tournament play. One-On-One Doubles is the half-court, serve and volley Singles game played crosscourt with the alley included. The game's tournaments enforce its serve-and-volley rule, on both serves, or there is a loss of point. Half-volleys are permitted. The returner can stay back or come in. The tournaments are played in a compact timeframe, in a round-robin format with short sets, no-ad scoring. Since the game's inception in 2004, One-On-One Doubles tournaments have been held throughout the U.S. and have been played at ATP, USTA, USPTA and ITA national events. One-On-One Doubles national tournaments have been held at the USTA Billie Jean King National Tennis Center, home of the U.S. Open. One-On-One Doubles Tennis is also played on college campuses nationwide. College Coaches use the format in their practice matches to develop their teams' all-court game and confidence. "We are excited to bring this world-class tennis event to Winter Haven! I am excited to grow One-On-One Doubles Tennis and its entertaining event format” states John Haggar, Tennis Director at the Country Club of Winter Haven. The event will be broadcast via Fox Sports Florida, New England Sports Network (NESN National & NESN Regional) and Tuff TV National Network (West Coast of U.S.) going out to 68 million homes. The event’s Pro-Am Doubles Tournament, with the Legends and Sponsors, will take place from 10:30-11:45 a.m. the morning of the main event. 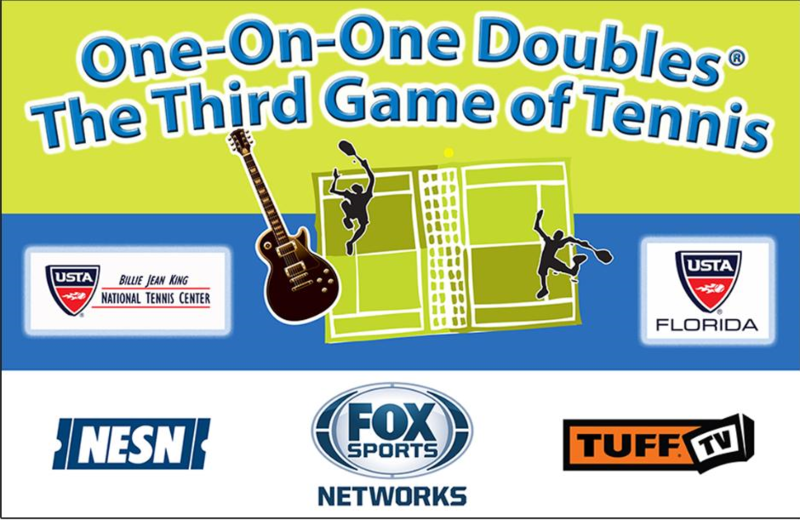 The One-On-One Doubles Tennis Shootout will take place from 2:15-4:30 p.m.; The Rockin’ Blues Concert will take place from 4:30-6:30 p.m..
Click Here to view the TV Promo video of the last One-On-One Doubles Shootout, in Melbourne, Florida on March 17. For more event information, call Ed Krass at (813) 478-3384 or John Haggar at (727) 647-3682.